"A novel of epic dimensions...marked by commanding sense of place...[and] mix of politics and poetry." "I would suspect that the author, Thomas Sanchez, a young writer of major talent, is part Indian. Only an Indian could have the insight into the poetry, the complexity of the Indian psyche, and an understanding of the Indian's transition of cultures." "A rare and wonderful book...vividly [brings] to life the Indian's ironic vision of the white man..."
"A classic to rank with THE GRAPES OF WRATH." "Nothing less than an American Epic." "Hailed as a landmark of our literature." 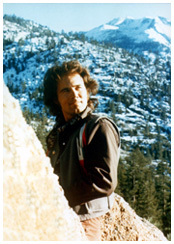 "One of the twentieth century's most important books of the American West. The big themes are in RABBIT BOSS...beauty of language, compassion for the downtrodden, a sense of the frontier past that carried its own seeds of destruction. Thomas Sanchez has dared to put the dream to paper." 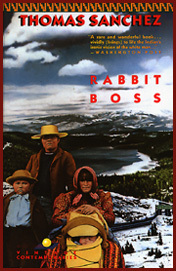 "RABBIT BOSS deserves to become an American classic. A great novel, spanning a century in the life and death of an Indian tribe, told with epic perspective and infinite compassion." "Etched in unforgettable prose...Sanchez is to be congratulated." "Illuminated by the author's personal, searing vision...Impressive as literature, history and sociology." "Its missions and messages go beyond the grievances of the past to embrace the ethos of a people in the timeless, raceless search of men to transcend themselves." "Compelling, mystic and mythic...what emerges is a panorama of the last 100 years in America and a savage indictment of the despoilers of the Indians and the land. A bold book." "RABBIT BOSS is beautiful, poetic, powerful. Thomas Sanchez has a dominating talent." "Thomas Sanchez writes with the self-awareness of Hemingway and Mailer, the epic scope of Faulkner, and the lean lines of Fitzgerald."